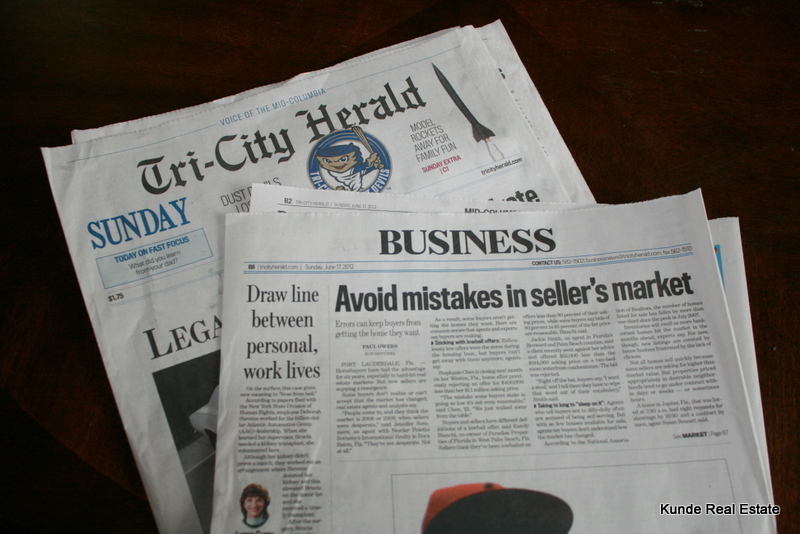 We were quite surprised to open to the business section of the Sunday Tri-City Herald to an article titled “Avoid Mistakes in Seller’s Market.” The original article was written by Paul Owers in Florida’s Sun Sentinel. Granted, it’s a long shot from here to Florida, where prices have increased and fewer homes are available for sale, but we’ve seen hints of improvement on the national level, and it always seems to trickle down to the slow-but-steady market here in the Tri-Cities. It’s not just Florida. Our relatives in Phoenix sold their house in 1 day. A client from Seattle sold in 2. I went on a househunting trip to Boise with my cousin and nearly all the available houses were 30 days-on-market or less. What does this mean for the Tri-Cities? It’s still a buyer’s market, but interest rates are incredibly low and houses that are competitively priced are selling fast. One of our listings under contract got a full price offer in 4 days on the market. We recently looked up a newly listed house in Burbank for a client and it was already under contract (just 3 days on the market). It is nice to see this kind of movement and gives us hope for a healthy housing market. We’ve always told our clients that if they’re moving locally, they buy and sell in the same market. Selling in a buyer’s market means you may get less than ideal when you sell, but you should be able to find an incredible deal on the house you purchase. Waiting to sell in the hopes of getting more money when the market improves means you’ll also be paying more when you purchase a home. Our advice is to consider your options and make the move when it’s right for you. Give us a call if you’d like more info on the “sold” prices in your neighborhood or if you’d like to take a look and see what’s available in the Tri-Cities in your price range. We’d love to help you out!